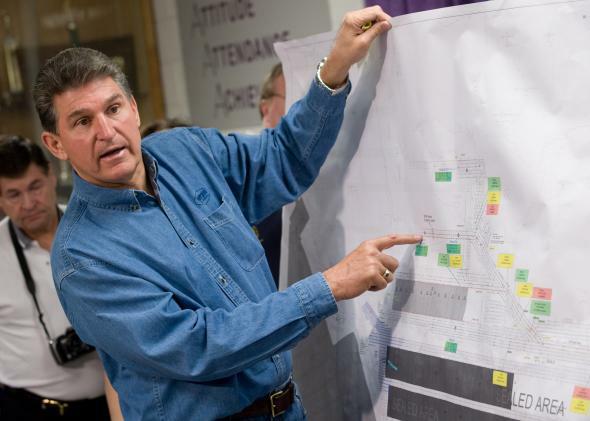 Joe Manchin's mandate-panic does not mean the end of Obamacare. This man can’t kill Obamacare by simself, and isn’t even trying to. West Virginia Sen. Joe Manchin said today that he was open to a one-year delay of the individual mandate portion of Obamacare—the very demand that Republicans are making in their debt ceiling offer! Within nanoseconds, conservatives started sharing the news as proof of Democratic wavering on a proposal that had, after all, won 22 House Democrats over when it was proposed independent of the debt limit. Are they right? Well, the problem is that Manchin has been swinging a dull ax at the mandate for nearly three years. In early 2011 he joined three Democrats also looking at a 2012 re-election campaign and mulled a delay of the unpopular tax. “I’ve always had a concern and a problem with the mandate, that we were forcing it, basically saying by the law of the land you have to buy the product,” he told reporters then. His allies at the time were Nebraska Sen. Ben Nelson, who’s since retired (and been replaced by Republican Deb Fischer), as well as Missouri Sen. Claire McCaskill and Montana Sen. Jon Tester. The politics have changed since then. Tester and McCaskill won’t face re-election again until 2018; they have made no new noise about tweaking Obamacare. * Of the four “red state” Democrats seeking re-election in 2014—Mary Landrieu, Mark Begich, Kay Hagan, and Mark Pryor—the first two have dismissed talk of adding Obamacare tweaks to the debt limit, and only the last of them has a first-tier GOP challenger. Manchin would need to pull along all of these Democrats to prevent the rest of the party from amending the debt limit bill to stop a delay of the mandate. *Manchin won a landslide for a full term, too, but Democrats want to win the open seat of Sen. Jay Rockfeller, and Manchin’s apparant compromise fetish makes life easier for the party’s likely candidate Natalie Tennant. Also, Manchin appears to believe in this.